Move things around and, tada, new space! For example, I have been completely sick of my living room for about two months. 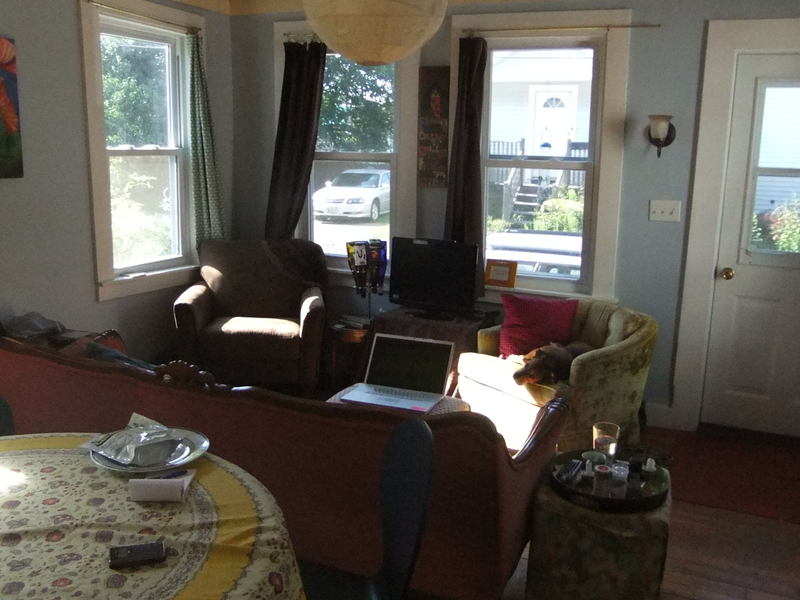 It felt cluttered and boring… I told my boyfriend I wanted to rearrange the furniture to make things flow better. It made me realize this might be more of a female phenomena when he said “Oh ok, my mom does this stuff all the time.” About 20 minutes of moving later, it looked like a different, much more open and airy room that I actually wanted to spend time in. Even the dog is mildly impressed. Case two is I found a sundress buried in the back of my closet. I was about to put it in the bag of clothes for donation when I realized that I wasn’t wearing because it had big foofy sleeves that I no longer liked. So I cut them off. In addition to now having one more thing I can wear when it’s ridiculously hot, I got several compliments last weekend on my ‘cute dress’. It is amazing what a little rearranging, shuffling, swapping, or otherwise reconfiguring can do to change your outlook. I like that twice this week, I’ve gotten the idea of change in my life without the wrecking my budget (or cluttering my already small space by going out and buying something new). How have you gotten the feeling of new without spending a dime (or even much elbow grease)? If you’ve moved from house to house, you might have a box of “pretties” that were bought for a previous home but might not have seen the light of day in this house. Pull out that storage box and see what you want to rearrange or update. Now to be fair … when we moved to our current home we expected to be here long term. As a result, the Victorian decor I had for an apartment 20 years ago will never be used again because I’m in a Colonial style house. That stuff eventually went to Goodwill. However, I repurposed a set of wooden shelf pieces that were purchased for the bedroom in our most recent rental to the kitchen (I have a bigger kitchen here). Hubby and I like to rearrange all the time. Not only do I rearrange what is in the room but I move items from room to room, like pictures and other smaller things. It sure does mix up things a bit.